Hooks and Pegboards The key to a well organized shed is decreasing the amount of “stuff” on your floor. 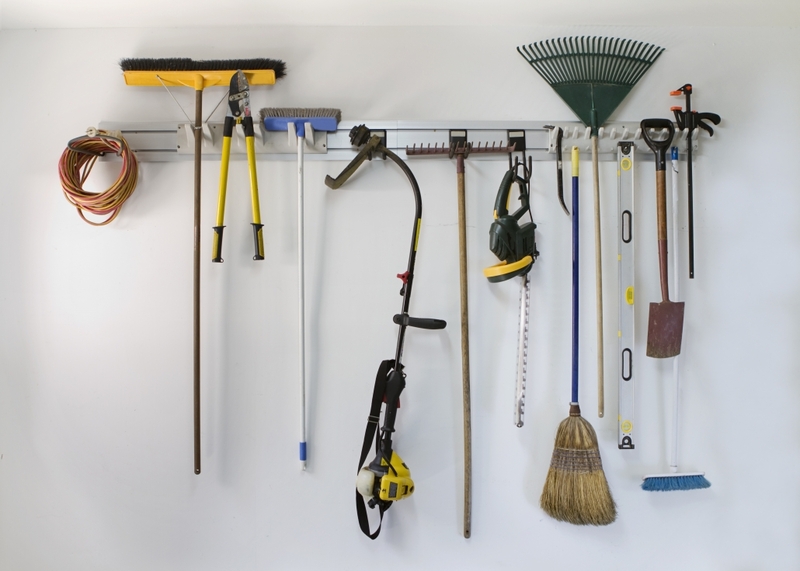 Hooks and pegboards can be easily installed and used to hang tools, bags, and even lawn trimmers. You can even paint your pegboards different colors to design a color-coded system for each tool or device. Shelving Shelves can also be attached to your peg boards. They also add more space and free up floor space. Large bins can be labeled with items such as crafts, cleaning supplies, and sporting equipment. Keep Hand Tools Handy Long-handled tools need to be easily accessible, but out of the way. A sturdy tool hanger to the inside of your shed's door is a great way to free up wall space for other items, while making your larger hand tools easily accessible. Magnetic Bars magnetic bars have been used by mechanics for years to hold and organize their tools. These strips also work great for metal garden gear such as pruning shears . Choose a bar with a magnet strong enough to hold the weight of your tools and you'll always have them within reach. Installing a Toilet Paper Holder This storage hack will keep your wires and twine organized. These useful outdoor items often knot up or get easily lost. Install the holder on its side in an area that is easy to access. A Garden Carryall Garden Carryalls are useful for holding smaller items such as markers, pens, scissors and clippers. Often, these items get left out on a workbench or even your shed floor. A carryall is a great place for small hand tools and perfect for grab-and-go trips to the garden. Garden Hoses Hoses are often challenging to keep in place. This DIY project from Martha Stewart is a practical and inexpensive caddy for a garden hose and sprinkler. Safe Storage Bins Having some bins to store smelly supplies, toxic pesticides, and other items that need to be handled with caution is a great way to prevent unwanted exposure or spills. These bins should be properly labels and kept out of the reach of children. Even though sheds are a key part of your organizational system, they’re not always given the thought or attention they deserve. If you are ready to give your shed some organizational TLC, SHARE this article!